Get the results. Review key takeaways. With up to 80 percent of breaches due to compromised credentials, more organizations than ever before are prioritizing privileged account protection. 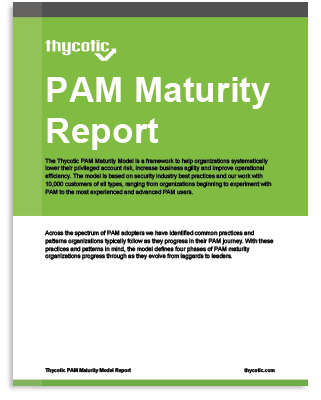 Thycotic’s “State of PAM Maturity” report highlights the disturbing results based on more than 450 responses worldwide to our online PAM Maturity Assessment. 85% are still struggling to achieve even basic Privileged Access Management (PAM) capabilities. 55% of organizations have no idea how many privileged accounts they have or where they’re located. Over 50% of organizations’ privileged accounts never expire or get deprovisioned. Only 18% of organizations are storing all their privileged accounts in a secure privileged access management vault or password manager. See the three major key takeaways from the survey and recommendations for action in the complete 2019 State of Privileged Access Management (PAM) Maturity Report. Take the free online assessment and receive an immediate report via email describing your maturity level and summarizing your responses. 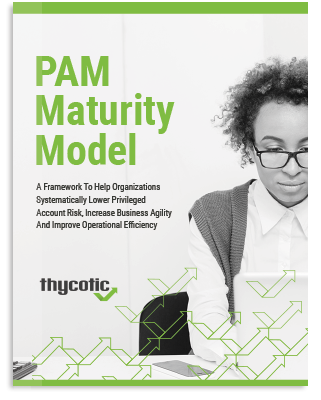 Learn how this Maturity Model can help your organization systematically lower Privileged Account risk, increase business agility and improve operational efficiency.